In Step 7 of A Guide to Addiction Recovery and Healing, (p. 41), there are three sentences that, when taken together, help us acknowledge and learn the only effective way to remove our limitations. We cannot remove our own limitations. We can turn to Christ, humbly acknowledge both our shortcomings and our inability to eliminate them and be perfected in Him and by Him. This important truth comes at a pivotal time in working the Steps. Steps 1-6 are essentially introspective. In these steps we examine ourselves and come to know, accept and understand the reality of who we are, our past behavior and our relationship with the Lord. In Steps 8-12, with the Lord’s help, we do our best to right past wrongs and become the person He created us to be. Step 7 is the fulcrum of the see-saw; the point at which the balance shifts. It is in this step that we learn to adopt true humility, understand and accept our limitations, and ask the Lord for His help with those things we cannot do for ourselves. I certainly tried to remove my own shortcomings. I thought that was what I was supposed to do! Long time readers know that keeping my desk organized is something I have struggled with. A quick glance at a nearby bookshelf turns up 7 books on how to get organized. There have been times when I tried very hard to implement those systems. At other times I put lots of thought and effort into coming up with my own system. None of this feverish activity has resulted in a permanent change. This limitation is a thorn in my side that could stay with me forever. I am slowly learning how to lean upon the Lord and apply the principles He has taught me in the past to remaining shortcomings, such as my organizational challenges. I am not content with my progress. But I know now, that it is only through Him that I am going to overcome this limitation. It is actually a relief to me to admit that this is something that I cannot figure out and overcome myself. I feel like I have spent years banging my head against the wall and have finally stopped. It is not that I will be satisfied with the mess. Rather, I need to continually seek His guidance, one day at a time. The critical component that is my responsibility is to diligently ask and willingly receive His guidance, and act upon it promptly when I do. The scriptures tell me that I must become perfect, or complete, even as the Lord is. I can be neither without Him. As I become one with Him, I can become perfect in Him. If I add one drop of ink to a small glass of water it will become cloudy. If I add one drop of ink to the Caribbean Sea it will still be clear and blue and stunningly beautiful. As I become one with the Lord, together we are perfect. It is because of His perfection, not mine. 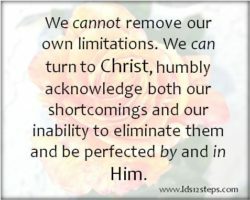 Have you humbly acknowledged your limitations? What are they? What have you done to become one with Him and be perfected in Him? What will you do today to take a step forward? Thanks for your thoughts Mira. I really appreciate your blog posts. I appreciate the reminder of the things that I have learned from step 7 a while ago. I struggle with my issues with procrastination. It truly is a thorn in my side. I needed the reminder that it is the Savior who can help me as I work to become better at recognizing and working on this weakness. I can’t do it myself! I too have struggled for quite a while with this. I know that the Savior, Jesus Christ, can teach me and help me to become more like him and help me to change some of the thoughts and behaviors that are part of this weakness. I know that Jesus Christ can do anything and that He loves each of us, as does our Heavenly Father! Prayer is a vital tool for me as I work on this step! Without prayers I don’t get very far because I am still doing things by myself! I need His help!